This is a simple game I created for my own amusement. Its the well-known naughts and crosses game, with a few optional twists. 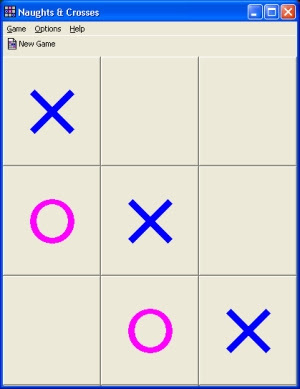 Playing against the computer, your aim is to get crosses across the board before the computer, either horizontally, vertically or diagonally (from the top of the board to the bottom). There are also options for a bigger board and to add obstacles should you wish to make the game more difficult! This software is free to download and install – there is no need to register or activate.